With six major interstate highways running through Chicago, the risk of being in a motor vehicle accident with a truck is high. In fact, thousands of people in Illinois are injured in truck accidents each year. There were 11,301 crashes involving tractor-trailers in 2016, the most recent year for which data is available. According to the Illinois Department of Transportation (IDOT), they accounted for 3.5 percent of all motor vehicle accidents in the state that year. Worse, there was a 30 percent increase in the number of people killed in tractor-trailer crashes on Illinois roads and expressways from 2015 to 2016. Tractor-trailer accidents account for 2.8 percent of all injury-causing crashes in Illinois. In 2016, more than 19 percent of injuries in such accidents prevented the victim from walking, driving or performing everyday activities that he or she was capable of before the crash occurred. Types of injuries included severe cuts, broken limbs and head or chest injuries, among others. IDOT’s report on crash data trends from 2012 to 2016 indicated that large trucks were involved in 5.8 percent more accidents in 2016, compared to the preceding four years. There was also a 26 percent rise in fatal crashes that involved large trucks that year, compared to the previous four-year average. This marked a 41.4 percent increase in a year-over-year comparison between 2015 and 2016. Truck accidents are far too common in Illinois. The enormous size and weight of commercial trucks make them extremely dangerous for passenger cars and other smaller motor vehicles. In truck accidents, more than 70 percent of the injuries and fatalities are suffered by automobile drivers and their passengers. No fee unless your case is successful. We promise we will only accept payment if we are successful in getting compensation for you or your family. I would recommend Briskman Briskman & Greenberg to anyone who has suffered an accident and sustained life threatening injuries. Thank you for all off your sincere tenderness and patience over the years and for listening when you could have been talking. Thanks again for setting the standard for great counsel. 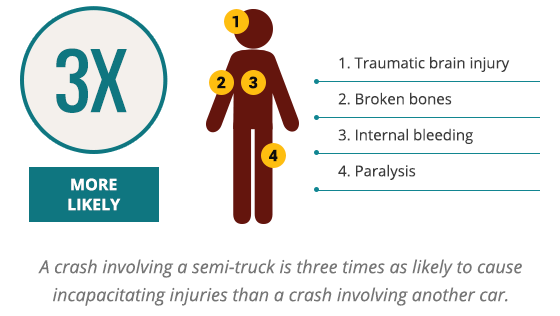 Truck accidents can result in a number of injuries ranging from minor to serious. Victims may suffer bruises, bumps or broken bones. In serious crashes, victims can sustain catastrophic, life-altering injuries, such as a traumatic brain injury, paralysis or even death. In comparison to motor vehicle crashes, which result in serious injuries approximately 14 percent of the time, a crash involving a semi-truck is three times as likely to cause incapacitating injuries. According to the Illinois Department of Transportation, such injuries can prevent victims from walking, driving or participating in day-to-day activities. There are also certain reported injuries that may not be visible or immediately evident such as limping, nausea, internal bleeding and pain. Often, it can be challenging to determine who is at fault in truck accidents. Although weather or road conditions can contribute to a crash, driver error is the leading cause of truck accidents. 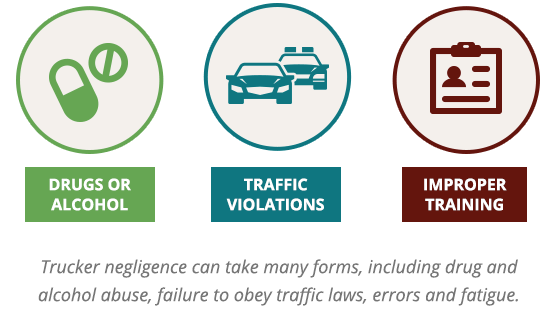 Trucker negligence can take many forms, including driving under the influence of drugs or alcohol, violating traffic laws, driving a commercial truck without proper training and failing to take required breaks. In some cases truck accidents may occur due to trucking companies violating state and federal laws. For example, a semi-truck driver may carelessly run a red light or experience drowsiness because his employer allowed the trucker to drive for too many hours straight, leading to a crash. Improper maintenance of vehicles or defective parts may also be to blame. When a truck driver is injured in an accident, even if he is at fault, he may be entitled to workers’ compensation. In Illinois, workers’ compensation benefits are paid regardless of fault. Employees who experience work-related injuries can receive benefits for injury-related medical expanses. Briskman Briskman & Greenberg has extensive experience handling personal injury and workers’ compensation claims. Our attorneys understand how to balance such claims and help victims pursue fair compensation. Seek medical attention immediately: The first step you should take if you or a loved one are ever involved in a truck accident is to seek immediate medical attention, even if there are no obvious signs of injuries. There may be internal injuries of which you are unaware. Additionally, some symptoms may not become apparent until hours or days after the accident. If you have been seriously hurt, you may be taken to a hospital for immediate medical treatment. Listen to your doctor: It is important to follow your doctor’s advice and recommendations regarding your injuries, no matter how serious. Keep all the medical records for hospital and doctor visits, therapy, and rehabilitation. Failing to document the full extent of your injuries, can end up hindering your case in court. Document the accident: Truck accident victims should also make sure to document the scene of the accident. Take as many photographs as possible from various angles. They can be valuable to building your case. Additionally, ask witnesses and other drivers involved for their names, phone numbers and other contact details. Contact your insurance company: Another necessary step is to inform your insurance company about the accident so that the process of filing a claim can begin. However, if the other driver’s insurance company contacts you, do not sign any documents or make any statements without talking to a lawyer first as it can affect the outcome of your case. Our commitment is simple: We promise that you do not have to pay attorney’s fees unless we make a financial recovery for you in your motor vehicle accident case. In short, we don’t get paid unless you do. If you or a loved one has been hurt in a truck accident, it may be possible to seek compensation for your injuries from the responsible party. Deciding to speak to an experienced personal injury lawyer after being involved in a truck accident is one of the most important steps you may take in the aftermath of a collision. With a knowledgeable truck accident attorney by your side, you can focus on recovering from your injuries instead of worrying about dealing with insurers and trucking companies. • Negotiate on your behalf with insurance firms, cargo companies and trucking businesses. Many trucking companies employ teams of lawyers to shield themselves from liability. As a result, it is necessary to have skilled legal representation to protect your interests. Otherwise, you risk having your case dismissed without financial compensation due to lack of proper evidence. Accidents involving commercial vehicles like trucks and big rigs tend to be complex. Such cases require an intimate knowledge of personal injury laws, as well as the regulations that govern the trucking industry. The attorneys at Briskman Briskman & Greenberg have years of experience handling Illinois truck accident claims and understand the unique legal issues involved. We strive to obtain the best possible result in each case so that you can get your life back on track. If you were injured or lost a loved one in a truck accident because of the carelessness of another, you may be able to receive compensation through a personal injury lawsuit.